This was a brilliant find after buying my house opposite! Spent six months working from this space whilst rennovating home – enjoyed sampling all the dishes on the wonderful menu – my delicious mexican influenced cooked breakfast was a daily staple… additionally exceptionally relaxed but contemporary decor, in keeping with the fab staff… every single one of them. 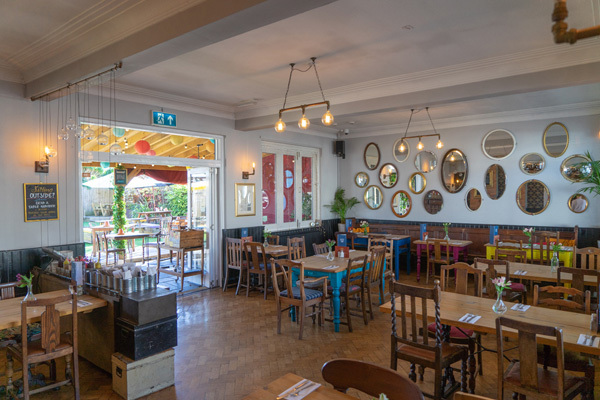 A real credit to the landlady Amy – who has done an A1 job of turning this pub into a brilliant destination venue – offering friendly service to children even pets… She has made the outdoor space a fun, unpretentious and colourful garden area – I really can’t fault the place. Not being a pub goer its the Spot to convert anyone – perfect for a casual coffee and laptop – to an intimate dinner for two or large groups – If anyone has nailed the pub experience for all (with respect to the many regular locals) its this one. 5 stars!!! I’ve visited under Couples, Family, Friends, Business and Solo and sampled Breakfast, lunch and dinner – even a solitary glass of wine watching quizz night. So lucky to live opposite… Thanks ALL!